[2017-02-17] Text edited to better comply with established job descriptions and responsibilities in different regions. Roles such as the DIT, camera assistant, and data wrangler can have a very supportive character on the film set – not only within the camera department but also for other departments. In this article I want to show you five examples of typical situations during production in which questions are answered or problems solved with almost no effort – with the support of the right software. In dynamic scenes or on-location shoots a qualified look into the footage can quickly verify if the exposure was save for a certain scene, and thus avoid surprises in post. Although having a calibrated, high quality monitor on a DIT cart, often there cannot be achieved a controlled, dim viewing environment with standard viewing parameters on set. The right tools applied to the shot footage can help to get a quick impression of exposure of a shot, although the exposure cannot be judged directly. Typical software such as Silverstack comes with false color and clipping filters, that indicate the levels of typical skin tone exposure as well as black and white clipping. This can give a clear quality indication for exposure even on a notebook screen. Post-production and visual effects have become an important part of a lot of productions in recent years. In order to to seamlessly fit CGI elements and real action without a lot of trial and error later in the facility, a post production supervisor sometimes already notes technical metadata such as lens data and camera settings on set. The software that’s handling the data wrangling can read all relevant metadata from typical camera formats and store it in a database. With Silverstack for example, the user can provide automatically collected metadata from camera footage, either as human-readable PDF reports or more technical formats such as XML or CSV – thus making this metadata accessible independently from the presence of the original camera files. Getting metadata directly from the camera’s footage reduces manual note taking work and the possibility of mistakes that cost extra effort in post. Solving problems easily and professionally on set is especially valuable when something goes not as intended. An example for that is the search for footage. Imagine a phone call from editorial or post production that a certain scene shot three weeks ago must be missing. With Silverstack’s Production Library locating such a scene in the database is easy – no matter if it’s visually via the comprehensive thumbnail overview of the entire production, or by a technical criteria such as “the slo-mo clips from shooting day 2” in Silverstack’s powerful table view with access to all metadata for sorting and filtering. 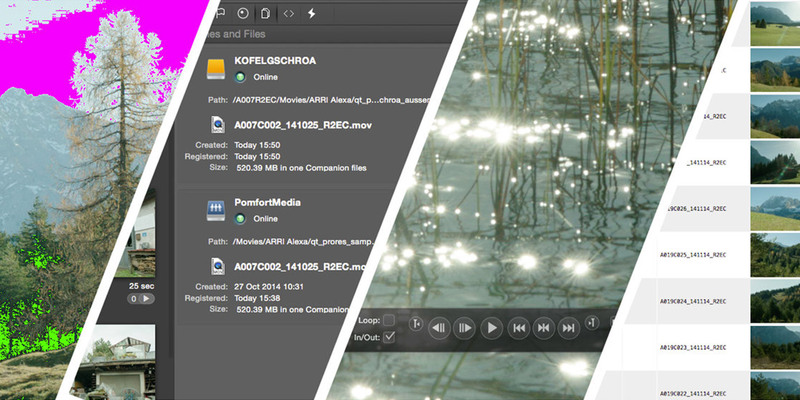 And once the clips are located in Silverstack’s Library, the information about the destination drives and folders to which the clip has been copied and transferred is just one click away. Being able to route images between different devices and monitors on a film set is crucial to maintain a flexible workflow. Although playback of footage is the typical responsibility of the video assist operator, there are varying jurisdictions in different countries where other crew members may also be asked to play a clip from a few shooting days ago – for referencing framing, lighting, construction and costume, or the actors’ performance. Silverstack not only supports a broad range of camera formats, but it also allows toutput to an HD-SDI interface. With the right routing capabilities, the clip can be displayed on the HD-SDI monitor on the set, where it’s currently needed. Keeping track of the work done is an important part of every department – either to prevent future continuity problems or simply to have a reference. With the hair and make-up department for example often not having access to footage, reference images from shot material can be provided to them. The right software can export still images of the source footage (be it RAW or log) and even apply a digital look onto that image (e.g. a look that’s used for dailies). With a small photo printer attached to the cart, the user can even provide prints of stills for the paper work, the archive, or simply to stick it to the makeup mirror. Silverstack can provide what set Polaroids did years ago – and much more. Being prepared for questions, with a software that assists to get the answers quickly and correctly at any time, let’s everyone involved sleep better at night. Silverstack’s complete library of clip information – be it technical metadata, look information, or manual annotations – is the perfect companion for that. This article highlighted just a few example scenarios where such a production library can help in situations, that are not even known when starting shooting.